Miracle-Gro AeroGarden™ is an exciting hydroponic system. You can grow fresh herbs, lettuce, year-round, in the comfort of your home. You may be wondering: Is it possible to grow weed in an AeroGarden? And is it worth it? The short answer is Yes. In this guide, I’m going to show you everything you need to know to grow weed your AeroGarden™ successfully including the best practices, the material needed, and exclusive pro-tips by experimented growers. The best part? It will pay for itself in only 2 or 3 grows in weed value! Be sure to buy the AeroGarden Bounty to grow your medical marijuana. At the time I wrote these lines, the available models are; Sprout, Harvest, Classic, Extra, Ultra, Bounty, and Farm Plus. 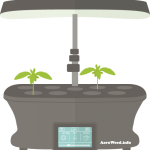 The AeroGarden™ Bounty (also available with Wi-Fi + a free app) is one of the most powerful models available. It comes with a 45 watt LED full spectrum growth light and a grow height extendable up to 24 inches which are required to grow weed and get a decent yield out of your grow. The Bounty model also includes a touch screen control panel that makes things very easy and fun to control! There’s also a bigger model available; the AeroGarden™ Farm Plus with 60W of dual LED power and 24 inches of growing height. Since the maximum grow height is only 24 inches (when the LED panel is fully deployed), it’s crucial to choose a strain that will stay small and compact. Some strains can grow big plants that are not suited for the AeroGarden small reservoir. The strains also determine the effects and medical attributes. Autoflowering seeds are perfect for beginners because they grow very quickly and stay smaller. Also, there’s no need to change the light cycle to induce the flowering stage, and you will get only female plants. Some strains can take only 10 weeks from seed to harvest. On the other hand, yields are usually smaller with autoflowering seeds and most have a lower THC percentage. Feminized seeds are also great, they allow growers to apply training techniques that aren’t recommended for auto and they can be cloned. You will have to change the light cycle from 18/6 to 12/12 to trigger the flowering phase. Increased darkness hours tell the plant the fall is coming and start creating buds. Key takeaway: Feminized seeds give more control to the experienced grower while autoflower seeds grow faster and are suitable for beginner grower. Now you have your AeroGarden™ Bounty and your seeds, you will need the material below, and the optional list would help to have more yield out of your grow, but are not required. Cannabis, like any other plants, needs calcium and magnesium. Your tap water may have calcium and magnesium in small concentrations, but likely not enough. If you’re using distilled water, you will need to add a Cal-Mag solution to your water as they are essential secondary nutrients for healthy plant growth. Botanicare Hydroguard® is well known for their unique beneficial bacteria that help to increase root mass and health. In my installation, I have added an external air pump with an air stone to make more bubbles in the root zone. 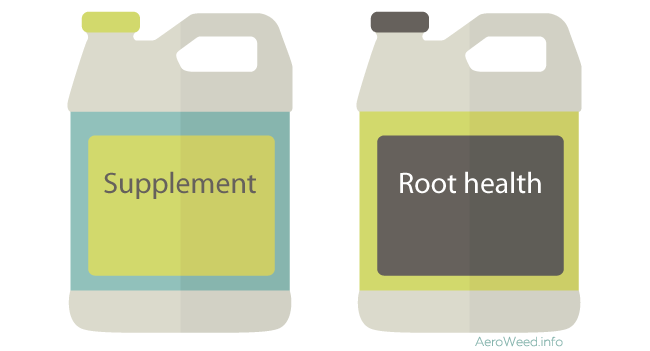 This helps to prevent roots rot, and bring more oxygen to the roots. 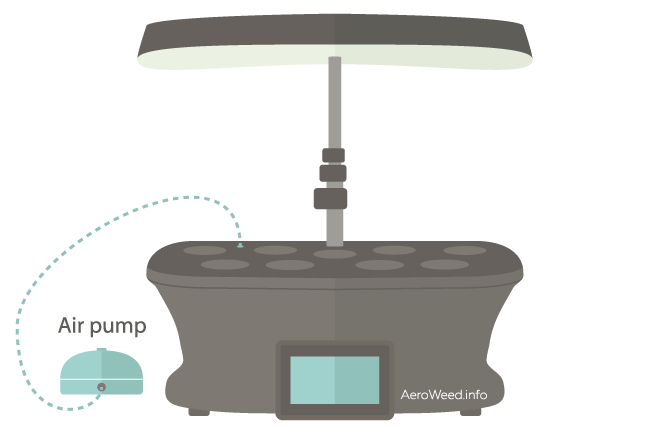 The external pump also helps to reduce the usage of the AeroGarden™ built-in pump. The water temperature will stay low, and you will be able to keep an optimal temperature (between 65 and 80 degrees Fahrenheit). On the top of the AeroGarden reservoir, you will find two water/air ports with rubber plugs that you can remove. They are the same size as the standard aquarium airline tubing. Just place the tubing inside one of them and put the air stone in the center of the bowl. Important: don’t use the provided plant food that comes with the AeroGarden™. This will not work, and you will lose your time and seeds. I use General Hydroponics Flora Series, and I always have great results with these nutrients. Some other popular alternatives are Advanced Nutrients and Botanicare. Your AeroGarden™ Bounty holds approximately 4 liters of water. I pour this amount of water into a big stainless steel mixing bowl. Let the tap water sit for 24 hours to become chlorine-free or use distilled water. Now it’s time to add nutrients to the water. Begin with half of the recommended dosage by the manufacturer. 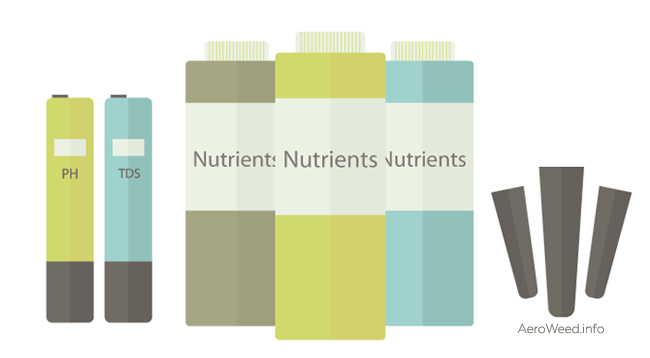 If you’re using GH Flora Series, take a look at this fully-tested nutrient schedule. The pH scale ranges from 0 to 14. The pH of the AeroGarden™ solution should be between 5.5 and 6.5. So I target 6, and I check with the pH pen tester every day and make the required adjustments with pH buffers (do not use pH up and pH down in the same solution). In the vegetative phase, the pH tends to go higher, and in the flowering stage, it tends to go lower. Keeping the pH in the target zone is essential. Out of this zone, the cannabis plant may be unable to absorb some nutrients, and this leads to nutrient deficiencies. If the pH fluctuates a lot or is out of control for a long time, your plant leaves will become distorted especially in the new growth areas. This can be reverted, but the affected leaves will not return to normal appearance. Key takeaway: pH problems can slow the growth of your cannabis plants and lower your yield. Before pouring the solution into the AeroGarden’s bowl, you need to verify the concentration of nutrient in the solution with the TDS digital meter. In the first weeks, the PPM should be around 400, and this amount increase as the marijuana plants grows. In the early flowering stage, the TDS could be around 1000+ PPM. High nutrient concentration levels will not help the plant to grow faster and can lead to problems like nutrient burn. Now the fun part! I assume you have already assembled your hydroponic system and you have transferred the solution to the AeroGarden reservoir. Now let’s take a closer look at the control panel. First, set the clock, and if you’re in the quick plant menu, select the grow anything option. Select the sun icon, and follow the steps to configure the grow light. 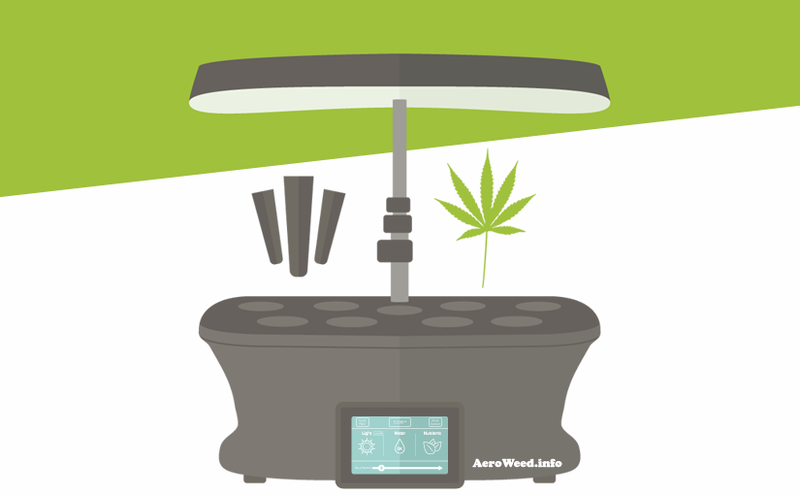 If you have autoflowering seeds, I recommend 20/4 light cycle. My settings are as follow; light open at 6:00 am, and close at 2:00 am. For feminized seeds, I suggest 18/6 for the vegetative stage, then switch to 12/12 to trigger flowering stage. Select the water icon, and then change settings. Follow the steps until you reach the pump on/off screen. In the vegetative stage, I recommend setting the pump 30 minutes on, and 60 minutes off. In the flowering stage, it’s better to give an oxygen boost in the water for the increasing root masse of your plants. So, if you don’t have an external pump, set the pump to 60 minutes on, and 30 minutes off. If you have the external air pump with an air stone, keep in mind this one should run all the time from seed to harvest. 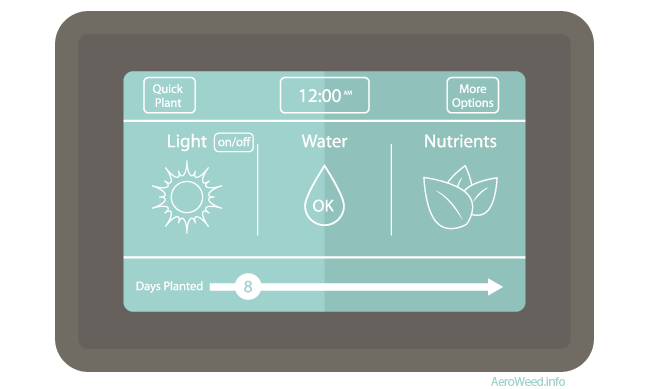 You can configure the AeroGarden built-in pump 10 minutes on, and 60 minutes off when you run the external pump. Finally, select the nutrients icon, and then settings. Set your nutrients cycle to 7 days. This is a simple reminder, and the AeroGarden™ will give you a warning every week to add nutrients and replace the water. I strongly recommend growing only one or two plants at a time. Your marijuana plants will need an increased amount of space while growing and try to put more plants will decrease the yield. Take two grow sponges and baskets, then place the seeds into the small holes. Be sure seeds are not falling too deep, (1/2” would be awesome). Cover the two pods with the provided transparent domes and put duct tape over the remaining pod holes. From my experience, it could take anywhere from 2 to 4 days to see the first tiny sprout.